Note: this article only applies to the old Time Clock. Your Time Clock device should display the local time on both the Time Clock App and on your Timesheets in your account. If you notice the time or date on your Time Clock is incorrect, this help article will show you how to set the correct time or date. If the clock-in times on your Timesheets are displaying incorrectly or being assigned to a different time zone, contact Tanda Support on the details at the bottom of the article. Below, we'll provide instructions and images on how to update the date & time on a Samsung device. If you have an Apple device you can have a look at this article from Apple on how to do this - Get help with the date and time. In the Date and Time settings, make sure “Automatic date and time” and “Automatic time zone” is selected. With these settings enabled, your Time Clock will use the time, date and time zone provided by the network the device is connected to. Under most circumstances setting these options will fix incorrect time and date on your device. Note: In order for your Time Clock device to use automatic date and time settings, it must be connected to a network. 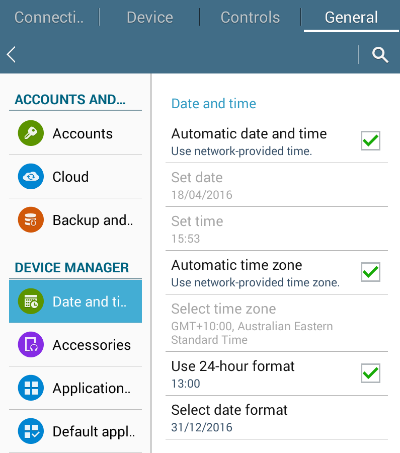 If these options are enabled and your time and date settings are still incorrect, you device may not be connected to a network. Have a read through our Troubleshooting guide for Offline device. 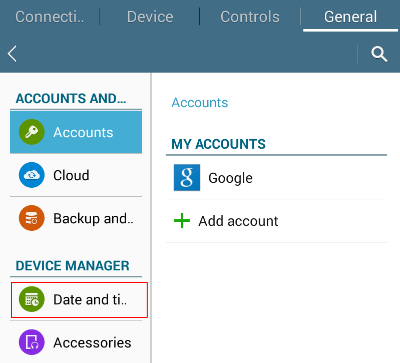 If your device is connected to a network and automatic settings are enabled and the time and date on your device is still incorrect, the time and date provided by your network may be wrong. To resolve this, contact your network administrator or deselect automatic time zone and automatic date and time and manually set these details.